When Maxwell first launched, it marked a shift in Nvidia's launch strategy. The GTX 750 Ti was and still is a good card, but starting with such a low-end product was unheard of for a new Nvidia architectural launch until then. The reason was that efficiency and performance per watt had overtaken pure performance as the company's primary focus. This makes sense in an increasingly mobile market, and indeed it wasn't long at all before the same GM107 GPU as used in the GTX 750 Ti found itself in more power-constrained environments like notebooks. After all, GM107 was billed as the most efficient GPU ever built, and it had the numbers to prove it, with the GTX 750 Ti regularly marching the GTX 480 in performance but at a fraction of the power consumption. At the time, many people, including ourselves, stated that they couldn't wait to see what Maxwell could do when applied at the high end. Well, now the time is here. Today, Nvidia is launching not one but two new graphics cards; the new flagship GTX 980 and the GTX 970, both of which are based on a brand new GPU, GM204, which Nvidia claims is not only the world's new most efficient GPU, but also the world's fastest. Bold words indeed. 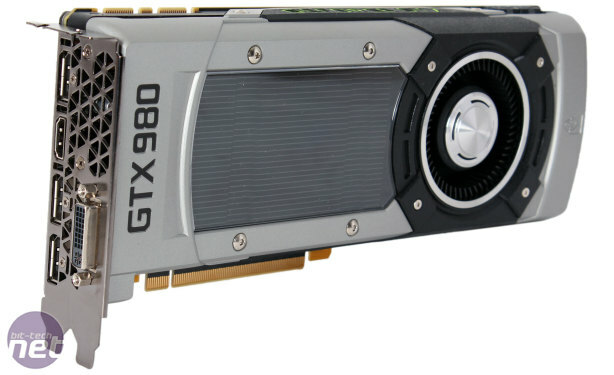 This review is focussed solely on the flagship GTX 980, with Nvidia having sampled us with a reference board. 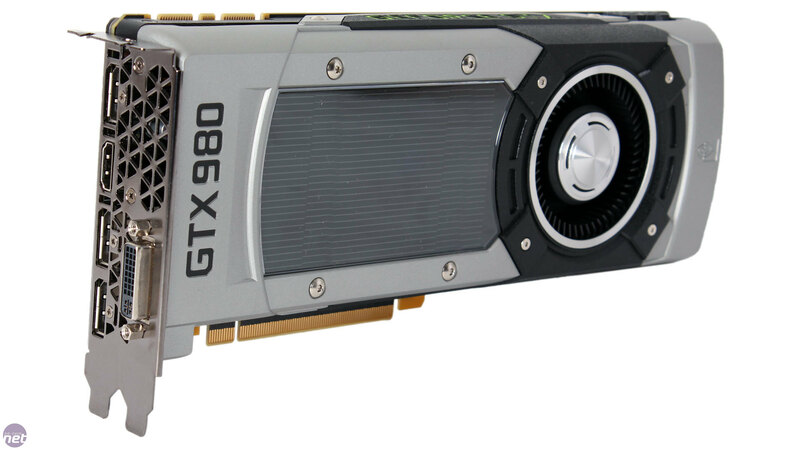 The GTX 970, meanwhile, has reference specifications but is not launching with a true stock card or PCB. Coolers and clock speeds are thus liable to vary significantly between Nvidia's partners. You can read our three card launch day roundup of GTX 970 reviews right here, featuring ASUS, EVGA and MSI. A new GPU launch wouldn't be complete without some naming confusion to clear up. If you're wondering what happened to the GTX 800 desktop series, the simple answer is that it's been skipped. The Maxwell GTX 750 Ti launching into the product stack between Kepler GTX 600 products was confusing enough, but Nvidia is using this opportunity to skip a series in the desktop parts to bring them into closer alignment with the mobile parts, which have fallen out of sync due to previous rebranding strategies. It's a bit of a mess, but them's the breaks. Maxwell's focus is still efficiency above anything else, but it should still see a small performance increase over the GTX 780 and even the GTX 780 Ti. After all, GPUs are incredibly power limited, so anything that improves efficiency also increases the headroom within a given power limit for more performance. The specifications of the new cards are outlined below, and discussed in greater detail over the page. The main thing to note, however, is the 165W TDP for the GTX 980. This is very low indeed, almost unbelievably so for a flagship card, and is testament again to Maxwell's efficiency. Despite a 33 percent higher core count and a 12 percent higher clock speed, this TDP is 30W lower than the GX 680, which also gives the GTX 980 approximately twice the GFLOPS per watt of that card – pretty amazing given that both are made on the same 28nm process. The GTX 980 is a DirectX 12-compatible card. In fact, all of Nvidia's Fermi, Kepler and Maxwell GPUs will support the upcoming API, although only GM2xx GPUs will fully support the newer rendering features like Conservative Rasters and Raster Ordered Views. Developers can access such features through the DirectX 11 API, hence the support for DX12 in Fermi and above, but as we understand it native support for them and therefore, presumably, better performance when using them will only be available in the latest GPUs, such as GM204. The new flagship card again supports up to four screens concurrently, but the display controllers have been upgraded, as it's now possible to run four 4K MST displays, the previous limit being two. Further, 5K resolutions are now supported – the maximum supported resolution is 5,120 x 3,200 at 60Hz. DisplayPort is still version 1.2, but HDMI has been upgraded to 2.0. GM204 is the world's first GPU with support for this standard, which has enough bandwidth to run 4K displays at 60Hz. Nvidia's fixed function encode unit, NVENC, carries with it the upgrades first found in the GTX 750 Ti, including a local decode cache and support for the low power GC5 state. However, it also adds native support for H.265 (HEVC) encoding, and H.264 encoding is around 2.5 times faster than with Kepler. This speed boost enables 4K video to be encoded at 60fps, which Nvidia is able to take advantage of with ShadowPlay. Finally, Nvidia's G-Sync technology is of course supported. In fact, you can run three G-Sync displays at once in a Surround configuration using the card's DisplayPort capabilities, should you so desire.